You had to live here to know about it. Hear someone mention it in conversation. It had nothing to do with summer vacations in Door County. 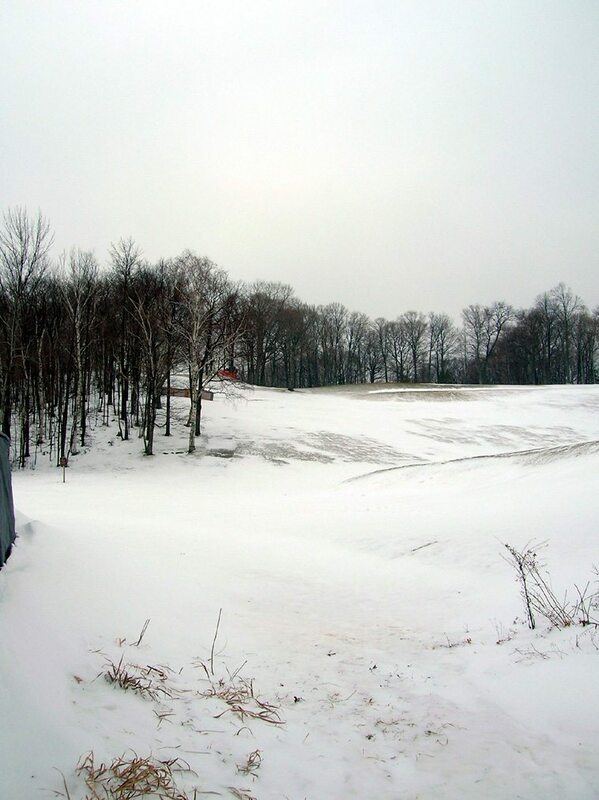 It was invisible spring, summer, and fall when it faded into the natural landscape as the 17th fairway of the golf course that was set so perfectly in one of Wisconsin’s most beautiful state parks: Peninsula Park, Door County—between Fish Creek and Ephraim. The transformation and challenge came in winter. White on gray. Deep snow. Long winters of no end. What to do come another weekend in cold storage? Ice skate? Ice fish? Cross-country ski? The hill seemed much higher then, forty years again when the kids were small and a friend in Ephraim mentioned it was a good place to take the kids in winter. It also seemed (and was) more ‘dangerous’ in the past. More like old-time sports for kids—mostly unsupervised by parents or anyone else. You found a rise in the landscape something like a hill covered in ice or/and snow—and you went at it. Gave no mind to cold. Numbness. Frozen hands, feet, face. You made fun. Sport. Took chances. The bigger the hill the better. 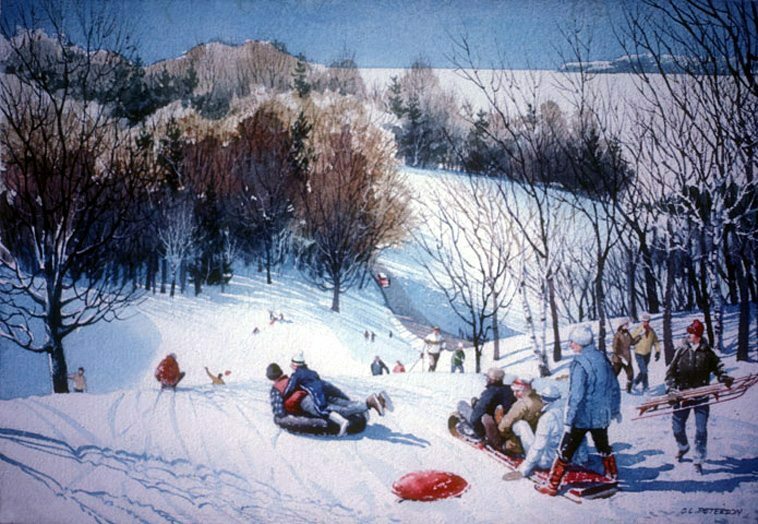 You slid down on a small wooden sled that didn’t steer too well…or a red-rubber-patched, black inner tube, a piece of cardboard, or the seat of your pants. Maybe an old pair of wooden skis hand-made by your friend’s Swedish grandfather. Or if you were really lucky, a toboggan that everyone could pile onto and yell all the way down. Nothing else to do when you came to rest at the bottom, (and hopefully turned over ) but get up, dust yourself off, and climb to the top of Hill 17 again…and again… It never got old. Sometimes a parent or someone handed you a cup of sweet hot cocoa from a thermos–which made the day even tastier. I look upon the scene today, alone, from the bottom of the hill: “No Sledding” a sign says, “Due to icy conditions.” Quiet. Not a soul in sight. A classic white-on-gray Door winter’s day…as they once were. And remain. I take a last look up into the stillness, hold it for keepsakes…till the hill begins to fade into a Charles (Chick) Peterson painting—the ghosts of kids bundled in winter jackets, caps, scarves, gloves. Their bright color, the only color in the landscape. The sight of Ephraim across the frozen bay. The sound of voices laughing, screaming up and down the hill. Painting by Charles L. Perterson. You can visit the artist on his web site by clicking here… or just click the above painting please! Again, you have an artful eye to catch the beauty of this peninsula with your camera. Paired with the Peterson painting, it made my day! Priceless, Norb! I hope it snows in NC again. You’ve inspired me to grab my camera and make for a hill! A wonderful piece with priceless pictures. I could feel the crisp fresh air and hear the sounds still echoing from those wonderful simple days. in Penninsula Park one year, through a real wonderland of shimmering trees. Usually, Alison my daughter, being an only child, had a friend with her. it was truly a winter wonderland in Penninsula Park those days, and probably now as well. A Very Very Happy New Year to you and your family. See you in the Spring. Dorothy, Alison, Peter, Max and Graham. 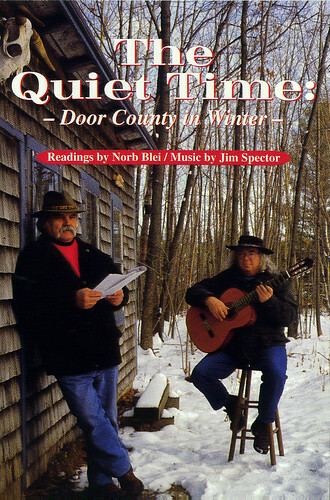 Norb, thanks for the images of the “warmth of winter.” While I did not do much sledding as a child, your words and the photo and painting brought back memories of two things: the time we celebrated Tom’s birthday in Door and time spent with students on retreat. I can picture Tom and me standing on the pier of Europe Lake, listening to the snow “ping” on our coats in the quiet. The other memory is of being on retreat with students in Woodstock in the winter. During break time the students enjoyed sledding down a small hill. I delighted in watching the playfulness of these young people whose daily lives were usually so packed with the demands of school, sports, work, etc. I always saw this as time for them to feel God’s presence in a special way in the joy of spending this time together enjoying nature. You take me back to Marquette park, Chicago, IL. It is the 1940’s and I’m sledding down a hill, steering around bushes (long gone now) racing against the boys in my grammar school class. Those were great pictures, beginning with the photo (I wonder about the bright red in the background) photographers ususally try to add a point of interest in a landscape, but I don’t think that’s the case here. Anyway, you are not only an artist with words, but with a camera, too. Who took it all away? One child hurt I suppose. But how sad, how sad. The old reader’s mind flashes to his youth, richer kids with the Cadillac sleds, Flexible Flyers. Standing guard at the highway below to warn of passing cars as we shot out of the night time woods and onto the highway. Young male teens skiing at night with simple lath ski poles pretending to be Finland Ski Patrols sneaking through the dark snowy woods to thwart a Russian attack. Thanks for the memories Norb. I love this, your two scenes known intimately but coming as a shock to this Californian on the first day of spring, lots of white but it is blossoms and the first goosebumps of air-conditioning. What a beautiful place to be, in your snow at coldest midnight.